5/29/15 @ 2345 hrs, Everett, WA. The alarm wakes us. 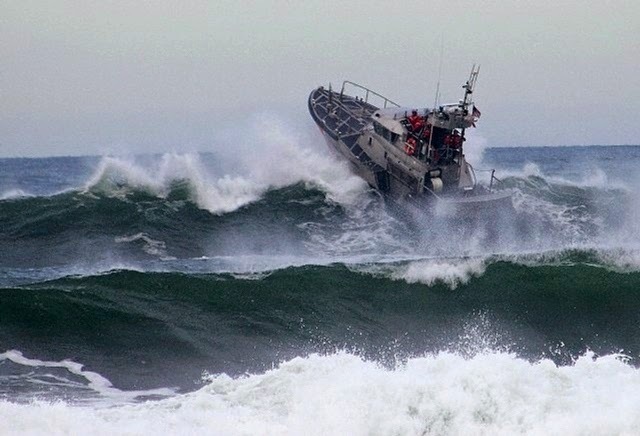 I get up and put my sea gear in the car while Judy makes coffee. Then its the drive in the dark south to Portland. 0400 hrs we arrive at the Thunderbird marina, sounds like a Las Vegas casino, where the games begin. Judy drops me off and I head down to the boat with my 1112 liter dry bag with shoulder straps. Judy drives home in the dark and early morning back to Everett. I can not thank her enough for her support of my craziness. The crew is up and stowing things. A crew of Ken Snow the owner, Geoff a McGiver fixer, Brandon an agile seaman & new boat owner, Chris a good helmsman, and myself. 5/30/15 @ 0430hrs, Thunderbird Marina. We cast off the dock lines go out onto the Columbia river come to a westerly heading for Astoria which is 70 nm downstream. We slide beneath the I5 bridge with 2 feet of mast clearance and on to the railroad bridge. Contact is established with the bridge tender and in 20 minutes the bridge will open. Its a pivoting bridge rather then a bascule bridge. 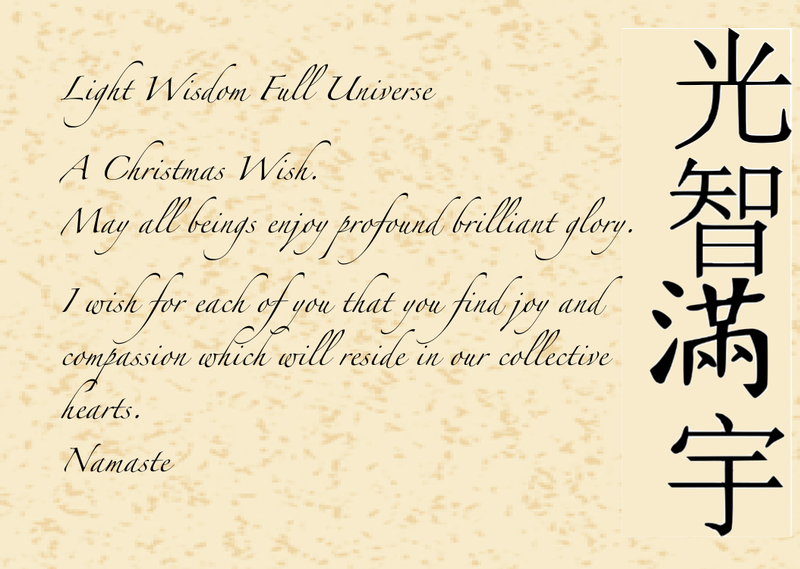 We circle a respectful distance upstream. Thru the bridge, we continue downstream. Many hours pass as we motor down the Columbia. Breakfast, lunch, drinks, afternoon snacks and talk of the trip. I reflect on my navigation planning for the trip. I had never crossed the Columbia bar. The stories are things of legend, perhaps Disappointment Cape sums it up completely. From the McKenzie Head at R8 (red sea buoy #8) out to R2, the end of the bar, it is 3.4nm. In a sailboat this means about one hour to transit the bar in favorable conditions. The bar is southwest in its orientation and is flanked by Peacock Spit to the north and Catsop Spit to the south. Favorable conditions are slack tide and 5kts of wind or less. Bulk Carrier on the bar in breaking seas. Unfavorable conditions are 15-25 kts coming out of the SW during an ebb tide of 7 kts. Twenty foot short stacked seas are fatal. Just imagine twenty foot beakers close together(5 seconds apart). So timing and weather are everything when crossing the bar. We arrive in Astoria at 1930 hrs with time to refuel, water up, and pump out. No party crew here, we are all really tired and head to bed by 2130hrs. Up to the marina for showers. After that its coffee and check weather, tide times, and the offshore Catsop weather buoy. Winds 5kts north, slack tide is 0753hrs and 4-5foot seas with a period of 12 seconds at the buoy. 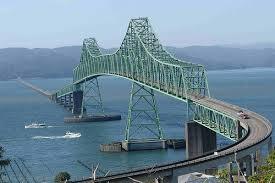 0600 hrs we depart Astoria turn to 249 degree (magnetic) heading at 5 kts and slip beneath the Astoria Megler Bridge. A cantilever bridge with a span of 6,545 meters opened in 1962. We are 10nm from the mouth of the Pacific as we pass under the bridge, clearance is 60m at high tide,with plenty of room. At Tansy Point we come to a 2790 m heading to Sand Island. As we skirt the edge of Catsop Spit, you can see the breakers on the Pacific side. 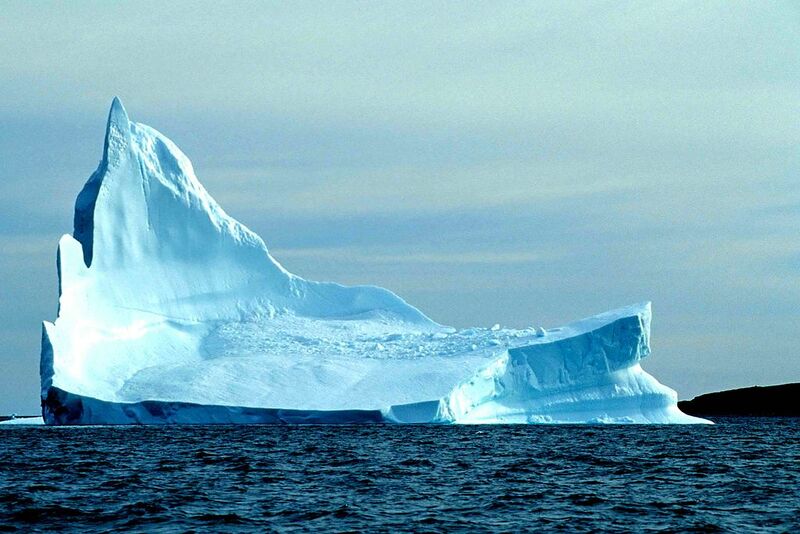 With Sand Island off the starboard we come to 2550 m and 3nm to the mouth. 0800 hrs we are at the R8 buoy. The new heading is 2090 m we start out across the bar with slack tide. Sea state is 4-6 foot rollers with a 10 second period wind out of the north at 5 knots. Sea lion heads are popping up frequently and all around us. They do have a large population in this area. In Astoria they have purchased an Orca sculpture to keep the locals off the pier. I suspect the sea lions are smarter then the fake Orca and eventually we’ll have a picture of an Orca sculpture surrounded by basking locals! All over the place in the water…heads popping up every place you look. A large container ship is heading in fishing boats going out. 0825 hrs two grey whales surfacing & diving off the port. 0900 hrs we are at R8 buoy and across the bar. Our depth has changed from 50 feet to 104 feet. At the 250 foot contour line we come to a new heading of 2550 m as we turn W toward deeper water. 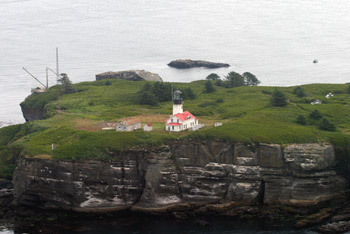 1100 hrs at 0460 13.663’N 1240 1321.746’W we turn north to 3270 m for the layline north to Cape Flattery. Our next way point is 110 nm to a buoy north west of LaPush. Sunday, 6/1/15 @ 0030 hrs 25nm west of Greys harbor the diesel dies and will not restart! Chris suggests we pull out the gib since we have no motor. Its done. Really no wind and small seas. 0130 hrs the conclusion is the fuel filter….We can’t find the filter wrench on boat. A good hour of searching commences while one member mans the helm as a lookout. NO FILTER WRENCH! *# Necessity is the mother of invention. Geoff is a true McGiver & rock star. Duck tape , a fiber strap, a locking leatherman and we have a filter wrench. Its now at least 0230 hrs. While Geoff and Brandon are working on the filter Chris & I are in the cockpit as lookouts. Earlier we had spotted a fishing trawler with all its lights off our starboard beam at a distance of 5+ miles. It has come closer and is still on a heading for us. Really no wind currently. All nav lights have been on including the deck lights which fully illuminate the genoa. I take the radio mike and on 16 broadcast “Large fishing trawler about 25 NW of Greys Harbor this is the sailboat in front of you with the illuminated foresail”. Two broadcasts on 16 and two on 13 with no response from the trawler. Another sailboat about a mile away did respond but nothing from the trawler! Fishing trawlers are always a problem. I think they use autopilot a lot and are out of the wheel house doing what ever!! 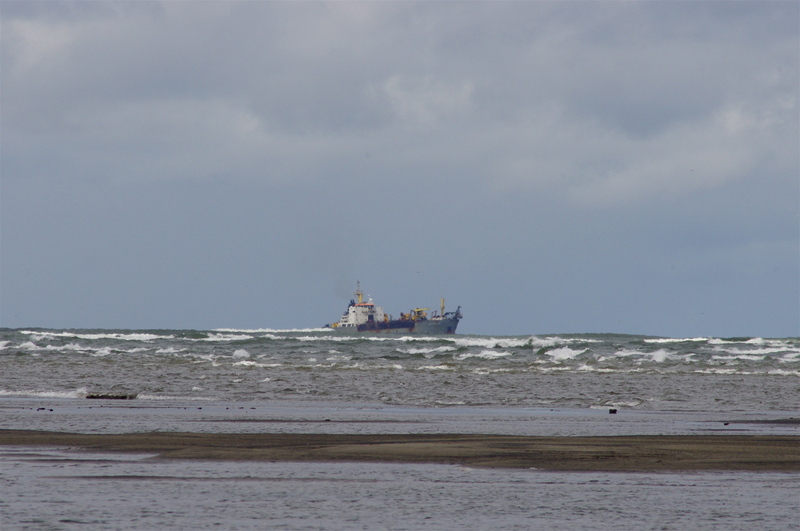 The trawler continued to approach until you could start to see its bow wake before it turned to starboard. The more I dwell on this incident the more threatening it becomes. I wish I had a solution but with no motor and no wind I’m gobsmacked. 0330 hrs the filter is done. Back to motor sailing. Everyone was pleased to hear that noisy deisel! The remainder of the night was quiet as we motor sailed towards Cape Flatter. 1300 hrs and we are off Cape Flattery. 1500hrs we round the Cape and check out the Duncan Rocks passage. Whitecaps in the passage so we go north and around Duncan Rocks. 1800 hrs we are on the approach into Neah bay. 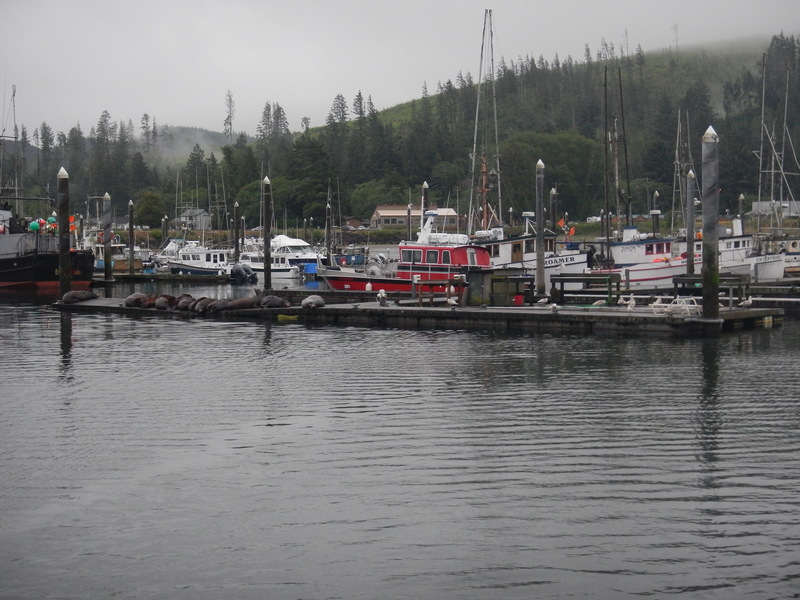 The marina is occupied by small fishing boats and several docks full of sea lions. We tie up fix dinner and prep for sleep. Sleep comes amongst a cacophony of sea lions. 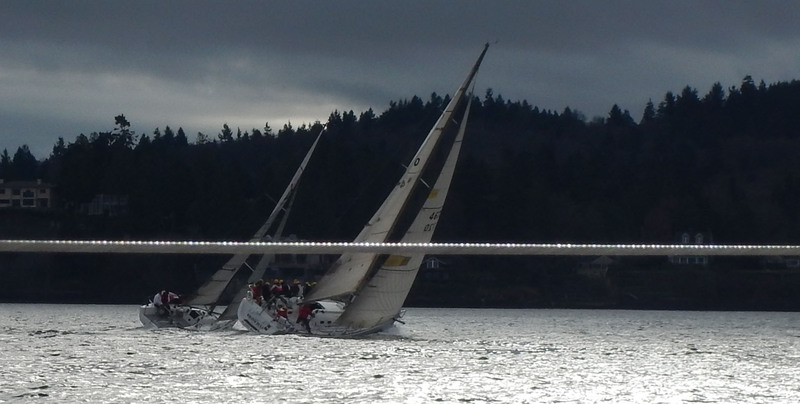 Saturday…..January 24, 2015 @ 11:00 hrs start time for the Iceberg regatta on Puget Sound. Weather at the start is 17 to 20 knots from the SE, 2 foot chop, 45 degrees air temperature. Beneath leaden skies rain is possible. The distance is approximately 14.5 nautical miles with 40 boats starting at five minute intervals in five classes from 24 foot crafts to over 35 foot boats. We are in the class 5 start at 11:25 hours on “Avalanche” a J105 in the FS (spinnaker) class. We have a crew of five. Paul is at the helm, Sarab is doing mainsail trim, Erica and Brian are doing jib sheet trimming. Raising, dowsing, and jibing the kite is a synchronized dance by the entire crew. My role is managing the spinnaker halyard and tack lines. 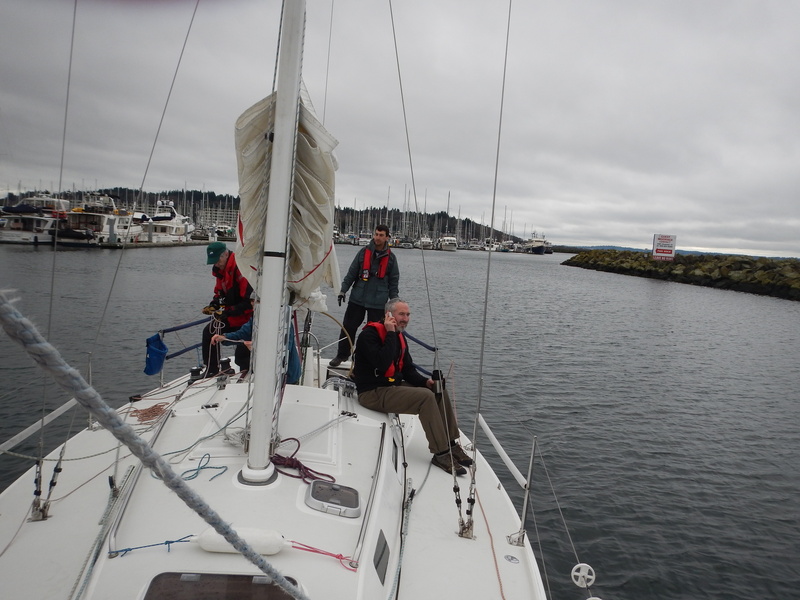 After rigging the kite lines for hoisting on the starboard side we motored out of the Shilshole marina and raised the mainsail. 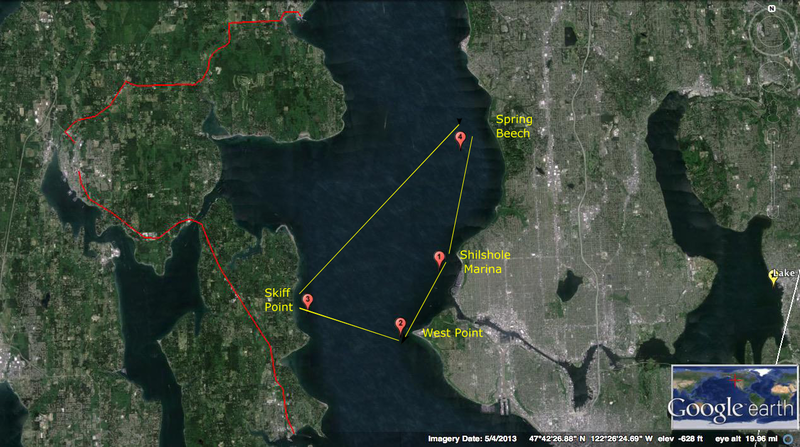 The start will be south, up wind, between the committee boat and the burger buoy (#1). The five minute horn sounds and I start the stopwatch running. Our start will be in 30 minutes. With the jib furled and the mainsail up we cycle between east west on the north side of the start line waiting for our start. We plan on a westerly beam reach approaching the line from the east. When the horn sounds we will swing the boat from a port beam reach to close hauled and bring out the jib. 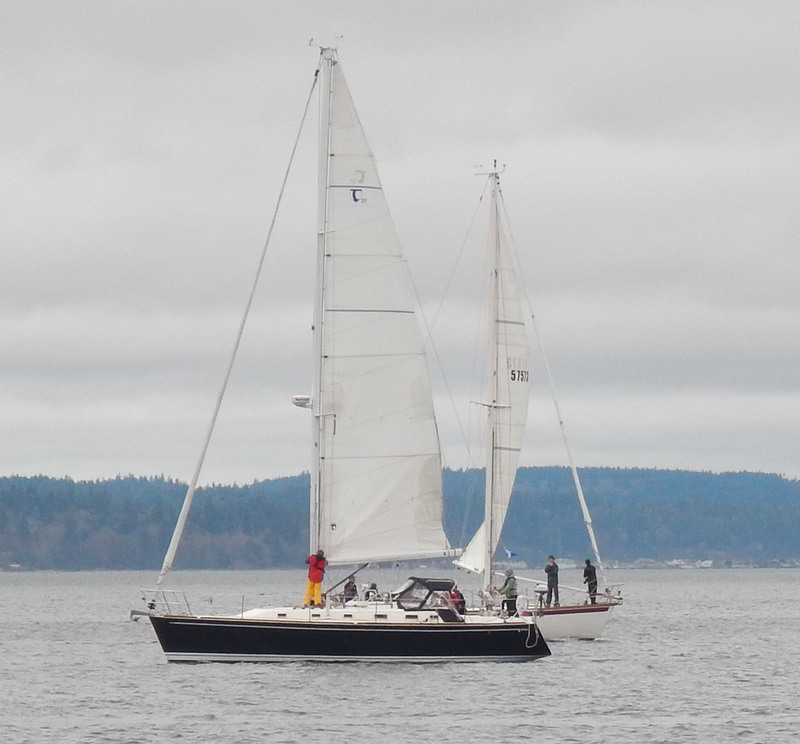 Our start horn sounds and we cross the line within 10 seconds of the horn on a port tack for West Point buoy (#2). At 1.9 nautical miles we round the West Point buoy and with the wind on port stern quarter, port broad reach, we hoist the kite & furl the jib. With Skiff Point buoy (#3) 2.8 nautical miles to west, we accelerate and get into position to round the buoy and jibe the kite for a starboard beam to broad run to Spring Beach some 6 miles to our north east across the sound. The wind pipes up…….to much power….so its time to douse the kite. A massive effort by the crew to get the spinnaker into the cockpit of the boat and not in the water. With the kite down things settle on the boat as we continue to the Spring Beach buoy (#4). Rounding the buoy inshore its a port beam reach towards the finish line 3.5 miles into the wind. Some boats stay inshore and some go out toward the center of the sound. The wind looks good for both! We choose offshore and initially have a great ride until, upon further assessment ,we realize it will take us two far out. When we tack in toward the finish line, our line will bring us in but too far behind the finish line because of the wind angle. The end result will not only be two tacks instead of one but the necessity of going in close to the beach before the final tack. With a boat speed of 9 knots and the crew ready to turn the boat quickly we head for the beach as observers on the beach stare on with disbelief. Finally, we tack and head for the line. There is a great release of tension mixed with satisfaction as we finish what we started two hours earlier.